I’m close to being broke. My next month’s rent is covered but beyond that I’ll have to make money to get by. I’ve previously been living (relatively) comfortably with a small amount of savings acting as a cushion. The main reason my finances have dried up is because I’ve been going to therapy. For the last couple of years I’ve dealt with anxiety and panic attacks related to various intrusive thoughts. They kept getting worse, reaching a point where I would regularly panic while driving on highways and have intense anxiety when going outside of my “comfort zone” near my home. It was severely impacting my life and making my world quite small. I realized I needed some help around the beginning of April and have been going to see a therapist once a week since. It’s helped a lot and I’m already feeling a lot more “normal.” The only problem is that at 115$ per session it’s really expensive. The extra expense quickly ate up my savings but it was worthwhile – it’s better to be happy than rich! I’m very satisfied with what I’ve accomplished even in just a couple of months. In an ideal world I’d keep going but after my session this Friday I’ll have to take a break and go a lot less regularly. Therapy has also had an unexpected benefit, helping me become much more organized at doing this odd job of mine. I’ve tended to get overwhelmed by the amount of things I could potentially be doing at any given time (including writing this blog, listing on Ebay, taking photos, building a photography light box and so on) and as a result I’ve waste or inefficiently utilized a lot of potentially productive time. We’ve worked on some scheduling strategies and I’ve become a lot better at time management. The results of this are easily seen on my Ebay account – 17 (of 43) listings have been added in the last few weeks with my last five sales also being recently-added items. Listing more items mean more sales and last week was quite a bit better than usual – more about that later! I didn’t do much hunting on Monday and Tuesday but made it out today for a run through TMR. 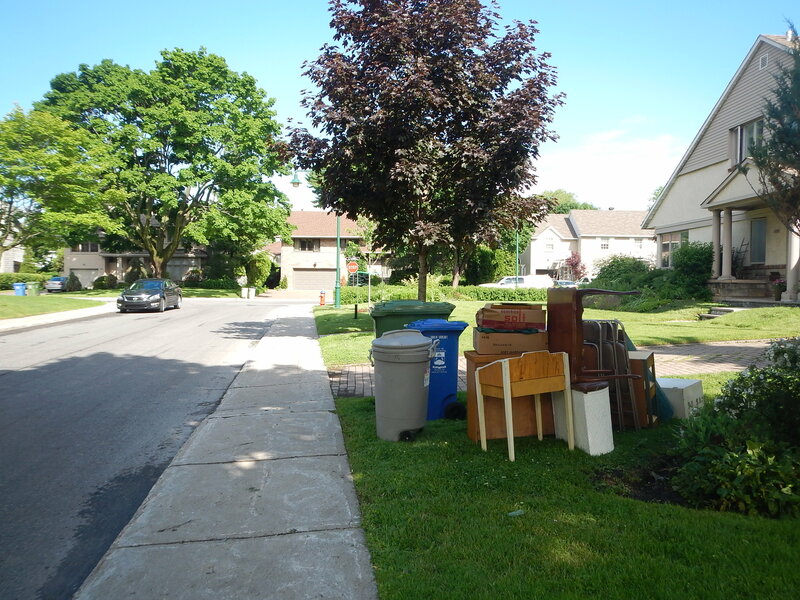 I came across a few nice pieces of furniture in front of a house I’ve been frequenting for a while, the same place that gave me the Grey Cup flag and silver pillbox from a couple posts ago. I think these piece had been stored in a basement for some time. 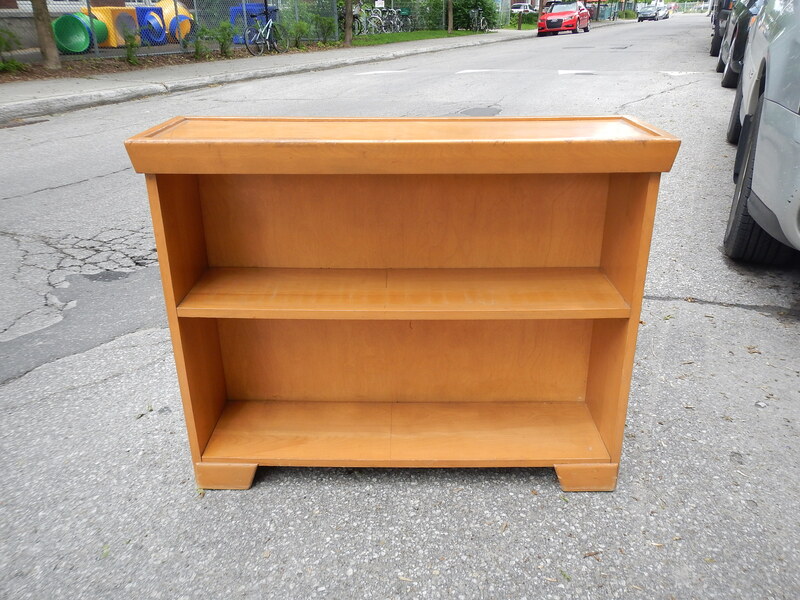 This solid wood bookcase is my favourite piece. It’s in excellent condition, just a bit of sticky residue at the top from old tape that should come off easily. The little table is nice and should be fairly easy to sell as well. I spotted these vintage water skis later on. The owner came out and tried to convince me to take a nearly brand-new toilet he had also put on the curb. He told me it had only been used for a couple years and that it just didn’t match his new place. I asked him why he didn’t just sell it and he said he didn’t have the time. I was already loaded with furniture and couldn’t take anything more but he was a cool guy. 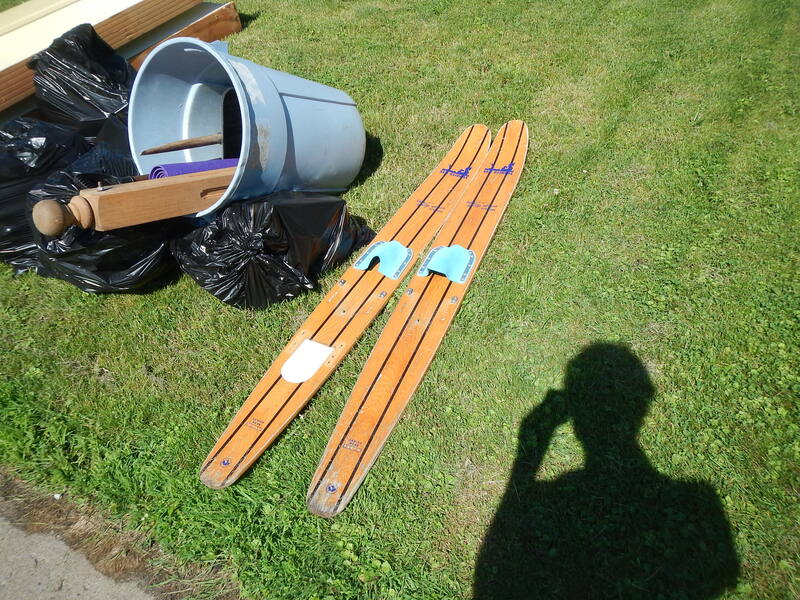 Water skis similar to this pair have sold for 100$ on Ebay but these aren’t in quite as good condition and seem to be missing the bindings. I think I’ll put them back out on the curb and maybe someone else will find them. I returned to the spot where I found the Expo 67-related ephemera last week. One bag contained photography bric-a-brac and a lot of expired film. I know people who like, maybe prefer to use expired film so those will find a good home. There was also a roll of negatives from a trip to Egypt in the 60s. 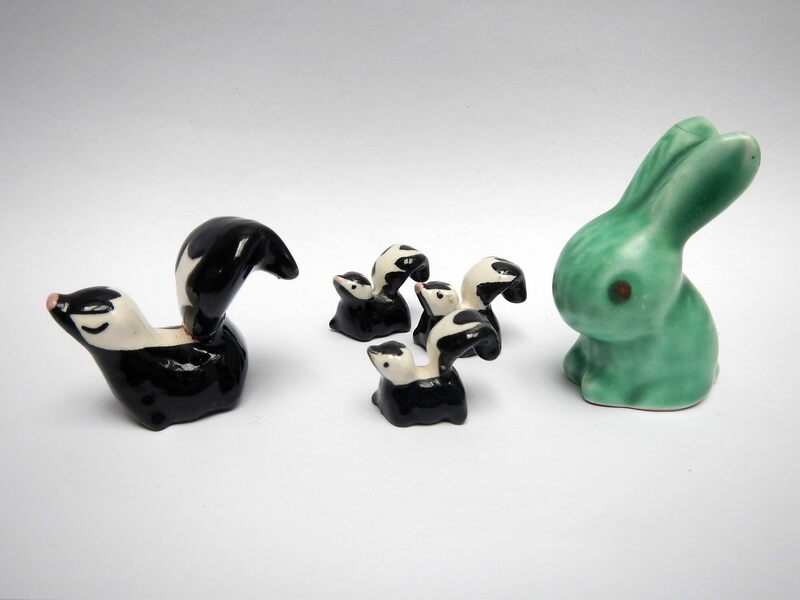 At the bottom of the other bag were these cute little ceramic figurines, the tallest of which is the rabbit at 2″ tall. They’re definitely vintage, the rabbit most obviously so but there are no makers marks. -Vintage turkish coffee set: CL for 10$. Found in TMR during the winter, glad to see it gone. -“Champagne” by Yves St Laurent (perfume): Ebay for 108$. This was a nice sale and the most money I’ve made off a scent so far. I found it in November but only got it listed last week. -“Gio” by Giorgio Armani (another perfume): Ebay for 50$. Another recently listed perfume flies off the shelf. I think I found this in the TMR last fall. -1824 German Jewish prayer book: Ebay for 150$. A local buyer bought it so I didn’t have to do any packaging and shipping. This is another piece from the spot near McGill where I found the Nazi Germany passport in late April. If I could make 318$ a week I’d be doing pretty well! It’s not entirely unrealistic if I keep listing things at a regular pace. A good yard sale would be a nice boost as well. I plan on going out tomorrow but to where I’m not sure. I’ll let you know if I find anything good. I appreciate you blog. I also appreciate your openness about your struggles with anxiety in this one. Be aware you are not alone. Way more people than we tend to think are dealing with issues like this. Congrats to you for having the courage to take steps to address it. It does not own you, and you won’t let it, as long as you keep working on it. Great post. I hope your finances get sorted out soon (and I expect they will, given your new focus). I wish you the best in all things. hi Martin – I so appreciate your blog. Making a living from selling what others are throwing away strikes me as creative, resourceful, remarkable. And courageous – to take a different path than most do. Such a wise and sensible decision to seek out help for your anxiety. I know a woman who has an anxiety disorder which has never been properly addressed. She is in her 40s, but for various reasons – the biggest of which is that she does not want to feel ‘different’, she does not seek help. That this woman has an anxiety disorder becomes obvious in the first 5 minutes of speaking to her. She is completely overwhelmed with each problem she encounters in her life. She does not have your inner resources – she could never do what you do. One thing that interacting with this woman has made me realize is that I too have anxiety issues, which I am also seeking counseling for. I wish you all the best. and please keep blogging. I look forward very much to your posts. Excellent post Martin. Wishing you all the best. Thank you for writing about seeing a therapist. I think that all too often people feel shame for doing this and keep it a secret or don’t go at all. So many more people could be helped if they could only realize that it is not shameful. You are doing such a good job ;I hope you are not anxious because you think you are not going nowhere in life.At your age,you have made wonderful progress in saving great discarded stuff and keeping it out of landfills.You have also saved so many items of historic interest.There are still many who look down on scavengers and disapprove of them.But your blog is so popular that you are causing many people to rethink their habits.I approve of bottle and can scavengers ,but people who scavenge such a wide range of items as you are fantastic.There needs to be more people like you in different neighborhoods. I put this here, as I had a quick look and couldn’t find your emal. I have read about this fellow before, and was amazed. 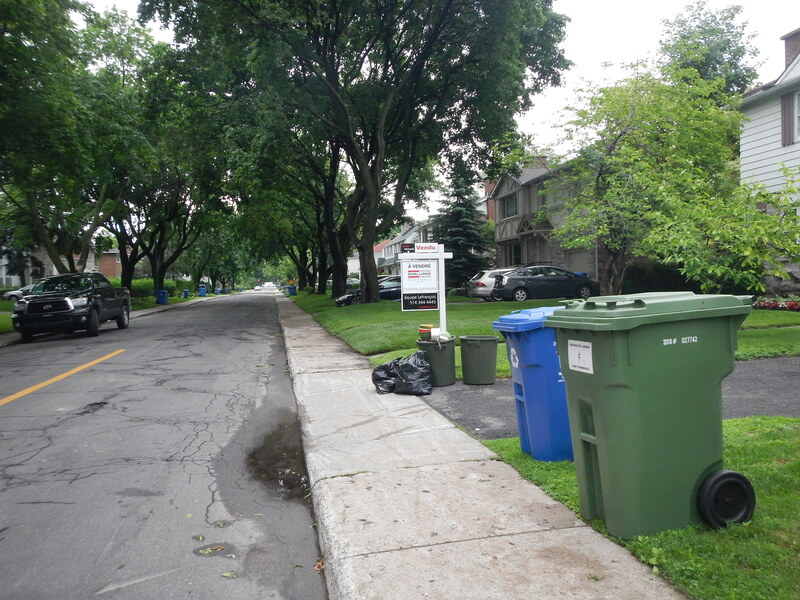 that region of downtown more often,and don’t forget neighboring wealthy Outremont—which you tend to overlook. Hi…the little green rabbit is sylvac. And he does make money…greetings from the UK the home of green rabbits!! !